What Will Be the 2017 Snapchat Revenue Total? Subject: What Will Be the 2017 Snapchat Revenue Total? The Snapchat IPO could happen as early as March, and investors want to know the projected 2017 Snapchat revenue total before making an investment. Many technology stocks are valued on forward revenue. So it's important to know how much Snapchat could make in 2017. Before we discuss Snapchat's 2017 revenue projections, we wanted to provide our readers with all the information we have so far about the Snapchat IPO. The Snapchat IPO will be the biggest since the 2014 Alibaba Group Holding Ltd. (NYSE: BABA) IPO. The ability of Snapchat messages to disappear shortly after they are sent is highly appealing to users concerned with privacy and security. The company was developed in 2011 partly as a response to concerns that messages and images on the web lasted a long time and could reflect less than flattering aspects of an individual. Employers and other organizations, for example, are known to look up applicants' Facebook Inc. (Nasdaq: FB) profiles. If they see inappropriate pictures, it could result in a very negative impression and have repercussions on employment prospects. In addition, there were concerns about whether removal of material from Facebook was permanent. Snapchat's "disappear in several seconds" feature solved that problem. And aside from its sought-after services, Snapchat has a key demographic for advertisers: teenagers and millennials. They are particularly drawn to its features, like the capability to add pictures, animations, and doodles to the messages, videos, and images. But investors are still skeptical of the Snapchat IPO. After all, Snapchat only generated $3.1 million in revenue in 2014. However, the massive revenue Snapchat could generate in 2017 is why the Snapchat IPO is the buzz of Wall Street right now. Two years ago, Snapchat generated $3.1 million. According to Bloomberg, Snapchat generated $59 million in 2015. That's an increase of 1,803%, but still not enough to make skeptical investors want to add Snapchat stock to their portfolios. But the projected revenue in 2017 is really what has Wall Street excited. By 2017, Snapchat could generate between $936 million to $1 billion in revenue. By 2018, Bloomberg estimates that revenue will hit $1.76 billion. That means from 2015 to 2018, Snapchat could increase its revenue by 2,883%. It took Twitter Inc. (NYSE: TWTR) nine years to generate $2 billion in revenue, and Snapchat could do it in close to six. Given a projected $25 billion valuation and estimated revenue of roughly $1 billion, Snap Inc. stock may be priced at 25 times its 2017 revenue. IPOs can provide tremendous opportunity to get in on the ground floor, but they also have several risks that investors should keep in mind. The first thing to keep in mind is that the companies are relatively new. They are trading on estimates, not on long earnings histories or decades-long track records. There is simply less available data for investors to analyze. The second thing to keep in mind is retail investors don't have a chance to get in on an IPO at the same price as large institutional investors. IPOs are sold to institutional investors – banks, hedge funds, and the like – first. They are offered the shares first due to the amounts they buy and the amounts of cash they have. The offerings to them are often priced lower than those available the first morning of public trading. 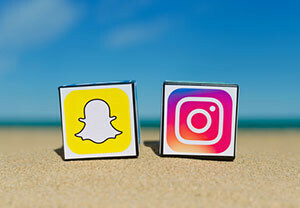 The third thing to keep in mind before investing in the Snapchat IPO is that the excitement surrounding an IPO can send the share price up substantially. It can then quickly fade. Facebook, for example, had an IPO offering of $38 per share. In the months that followed the IPO, it lost half its value. If you still want to buy in on the Snapchat IPO, Robinson recommends placing a limit order as close to the IPO price as possible. That will prevent you from buying in at inflated prices. Because this could be one of the biggest IPOs in years, we know investors have a lot of questions. That's why we made this guide for our readers that covers everything you need to know about the Snapchat IPO.